Since the chilly winter mornings and snow has just arrived in Valais, we are “staying home” for this week’s blog. Well, sort of speak… We all know that Klewel is a spin-off of the Idiap Research Institute, and Idiap is among the most active independent research institutions in information technology. 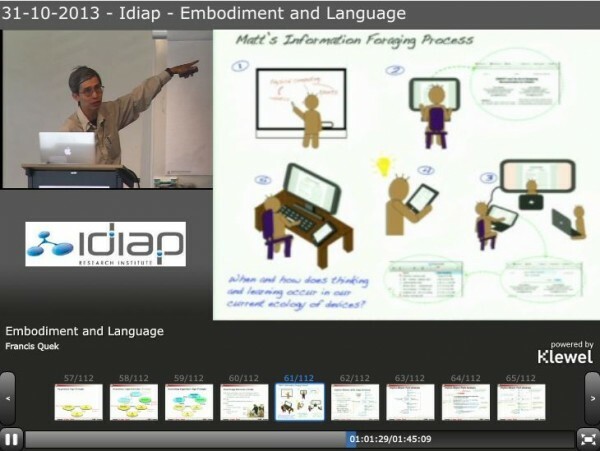 The Idiap Research Institute, based in Martigny, is a non-profit foundation that conducts basic research and development in the area of multimedia information management. So, Idiap is home for Klewel. That is why we are proud to present you the last event of their speaker series, which was an extremely interesting lecture from Francis Quek, Ph.D., who is a currently Professor of Visualization and TAMU Chancellor’s Research Initiative hire at Texas A&M University. He performs research in embodied interaction, embodied learning and sense making, interactive systems for special populations (individuals who are blind, children, older adults), systems to support learning and creativity in children, multimodal verbal/non-verbal interaction, multimodal meeting analysis, vision-based interaction, multimedia databases, medical imaging, assistive technology for the blind, human computer interaction, computer vision, and computer graphics. He has published over 150 peer-reviewed journal and conference articles in human-computer interaction, computer vision, and medical imaging. Professor Quek is a member of the IEEE and ACM. His lecture on Interacting with the Embodied Mind talked about many of the new theories Professor Quek has been exploring.He was quick to establish that our minds are ‘designed’ for us to function as embodied beings in the world in ways that are: 1. Physical-Spatial; 2. Temporal-Dynamic; 3 Social-Cultural; and 4. Affective-Emotional. These aspects of embodiment give us four lenses to understand the embodied mind and how computation/technology may support its function. He adopts a two-pronged to human computer interaction research by first harnessing technological means to contribute to the understanding of how embodiment ultimately ascends into mind, and second, to inform the design and engineering of technologies that support and augment human higher psychological functions of learning, sensemaking, creating, and experiencing. In line with the first approach, he first shows how language, as a core human capacity, is rooted in human embodied function. We will see that mental imagery shapes multimodal (gesture, gaze, and speech) human discourse. In line with the second approach, he then presents an assemblage of interactive projects that illustrate how our concept of human embodiment can inform technology design through the light of our four lenses. Projects cluster around three application domains, namely 1. Technology for special populations (e.g. mathematics instruction and reading for the blind, games for older adults); 2. Learning and Education (e.g. learning and knowledge discovery through device/display ecologies, creativity support for children); and 3. Experience (e.g. socially-based information access, experience of images, affective communication). This lecture has been recorded and made available for everyone to see by Triskel from Klewel. Triskel is a comprehensive webcasting platform to record and publish presentations given at events such as international conferences. Klewel provides this cutting-edge technological tool that’s simple to use, and above all, in-depth knowledge of the world of events.